The earthquake that struck Haiti three years ago this month sent a concrete wall crashing down onto the 30-year-old dancer Fabienne Jean. Her right leg was crushed and had to be amputated. 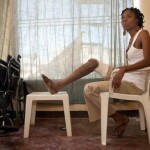 When Fabienne danced again, she was hailed as a symbol of Haiti’s post-earthquake recovery. But as reporter Jacob Kushner discovered, the quest to rebuild one woman’s life would take much more than that. Kushner followed Fabienne’s story for nearly a year, reporting from Port-au-Prince, Boston and New York. Listen to the five-part series and see photos by Nick Kozak at wlrn.org. February 21, 2012 (WLRN) – This week millions of people across Haiti will parade in elaborate costumes and dance to the blaring horns of rara and Haitian pop music as they celebrate the nation’s largest cultural event of the year, Carnival. As Jacob Kushner reports from Port-au-Prince, one Haitian-born Florida man is working to ensure that the hundreds of thousands of Haitian immigrants living in South Florida will be able to join them in spirit.